Pontius Pilate served as the Roman prefect of Judea from AD 26 to 36. Pilate is mentioned in the four canonical Gospels (Matthew, Mark, Luke, and John), by the Roman historian Tacitus, by the Jewish historians Josephus and Philo of Alexandria, and others. 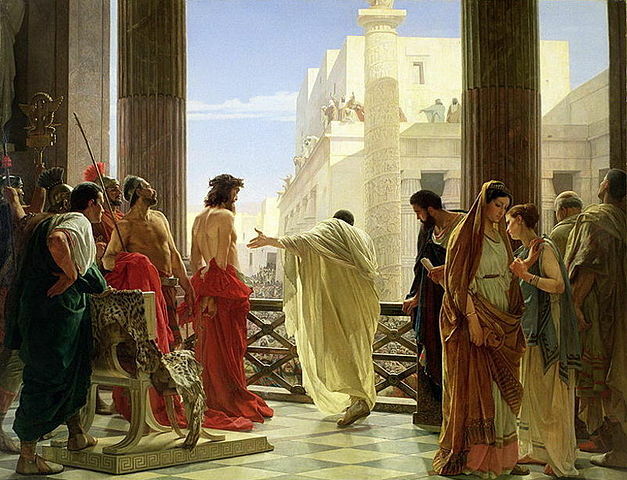 What we remember about Pilate, however, is his involvement in the trial of Christ. Those familiar with the Gospels will recall the details of that trial: how Pilate inquired whether Christ was an earthly king, in rebellion against Rome; how Pilate declared having found no fault in Christ; how Pilate offered to set Christ free for the crowd; how Pilate washed his hands, in a futile gesture proclaiming his innocence of Christ’s blood. But it is Pilate’s question about truth that has echoed down the ages. As the prisoner stood before him, Pilate undoubtedly thought that he held Christ’s fate in his hands. Nothing could have been further from the truth. Christians know that Christ went willingly to His death (Ps. 40: 7-8; Matt. 26; 42; John 10: 11, 15, 17-18); that the plan of Salvation pre-dated the existence of the world (1 Pet. 1: 20; Rev. 13: 8). It was not Christ who was on trial before Pilate. It was Pilate who was on trial before Christ…Pilate and all those who believe what he believed about truth. That truth is relative. That truth can be manipulated. That truth is irrelevant. Christ is the way, the truth, and the life as surely now as He was 2000 years ago, when He stood before Pilate. As surely as He will be, when we stand before Him. Amen. On the day that we stand before Jesus,all of our concocted versions of truth will have withered away,leaving us no excuse. Sobering reality Anna. Many of our politicians and news correspondents could use the reminder. You are a great encouragement to me, Gbolabo. 🙂 Though you address a wide range of topics as a poet — serious and otherwise — you invariably seek after truth. I gladly recommend your website gbolaboadentunji.wordpress.com to readers. Everywhere we look today we find corruption and spiritual wickedness in high places. Jesus did not deny He was a King. Pilate asked Him (paraphrased), “Your own people have rejected you and want me to kill you. What have you done?” To this Jesus replied, “My kingdom is not of THIS world!” THAT was His offense! Jesus was marked to be a target of this world system and the prince of this world who governs it because of His allegiance to His Father. So it is with everyone in whom He dwells. The question all of us need to ask is, “What kingdom am I of?” Like Jesus said, “For where your treasure is, there will your heart be also.” (Luke 12:34, KJ2000) When we get all wrapped up in politics or are spun-up by the news media and the affairs of this world system, we should realize where our hearts are at and what kingdom we are of. “Father forgive them, they know not what they do.” This is the prayer of our heavenly King for those caught up in the spirit of this world system. God help us. for claiming to be king! And still today, so many continue to deny Christ’s diety. Truth is so obvious, once you know the Truth!